Practice Theory and Education challenges how we think about ‘practice’, examining what it means across different fields and sites. It is organised into four themes: discursive practices; practice, change and organisations; practising subjectivity; and professional practice, public policy and education. Contributors to the collection engage and extend practice theory by drawing on the legacies of diverse social and cultural theorists, including Bourdieu, de Certeau, Deleuze and Guattari, Dewey, Latour, Marx, and Vygotsky, and by building on the theoretical trajectories of contemporary authors such as Karen Barad, Yrjo Engestrom, Andreas Reckwitz, Theodore Schatzki, Dorothy Smith, and Charles Taylor. The proximity of ideas from different fields and theoretical traditions in the book highlight key matters of concern in contemporary practice thinking, including the historicity of practice; the nature of change in professional practices; the place of discursive material in practice; the efficacy of refiguring conventional understandings of subjectivity and agency; and the capacity for theories of practice to disrupt conventional understandings of asymmetries of power and resources. Their juxtaposition also points to areas of contestation and raises important questions for future research. 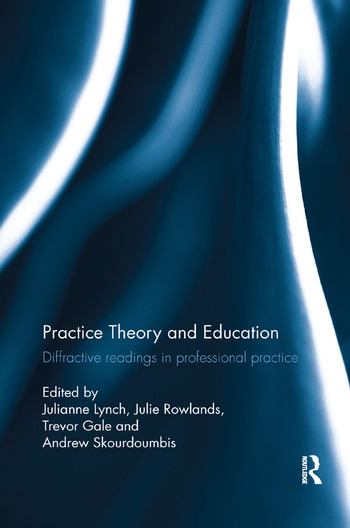 Practice Theory and Education will appeal to postgraduate students, academics and researchers in professional practice and education, and scholars working with social theory. It will be of particular interest to those who wish to move beyond the limiting configurations of practice found in contemporary neoliberal, new managerialist and narrow representationalist discourses. Julianne Lynch is Senior Lecturer in Curriculum and Pedagogy at Deakin University, Australia. Her research focuses on curriculum innovation and the everyday practices of teaching and learning, particularly in relation to new media and new communication technologies. Julie Rowlands is a Senior Lecturer in Education Leadership at Deakin University in Australia. Her research takes a critical sociology of education approach, drawing particularly on the theories of Pierre Bourdieu, to examine higher education systems, governance, leadership, academic work and organisational change. Trevor Gale is Professor of Education Policy and Social Justice at The University of Glasgow, where he heads the School of Education. He is a critical policy sociologist researching social justice in contexts of influence and of practice in education. Andrew Skourdoumbis is a Senior Lecturer in Education (Pedagogy and Curriculum) at Deakin University, Australia. His research engages with matters of curriculum theory encompassing policy analysis, teacher practice and educational performance. Andrew is interested in global reform efforts in education that impact teacher practice and the way that exacting methods of research govern school education policy and teacher performance.? ?